Here is the fourth installment in our Habitat Restoration Series for Spring. Common Cattail (Typha latifolia): Native to North American wetlands, shores, banks and even ditches, Cattails are an important species for wildlife. Red-winged Blackbirds (Agelaius phoeniceus) and certain species of duck and geese will use Cattail “groves” for nesting. Fish can find safety from prey and sun in the Cattails or lay their eggs among them (as do many other aquatic animals) while Muskrats (Ondatra zibethicus) and Canada Geese (Branta canadensis) use them as a food source. Growing from rhizomes, Cattails are generally found in clumps or stands where each individual is often a genetic clone of its neighbor. 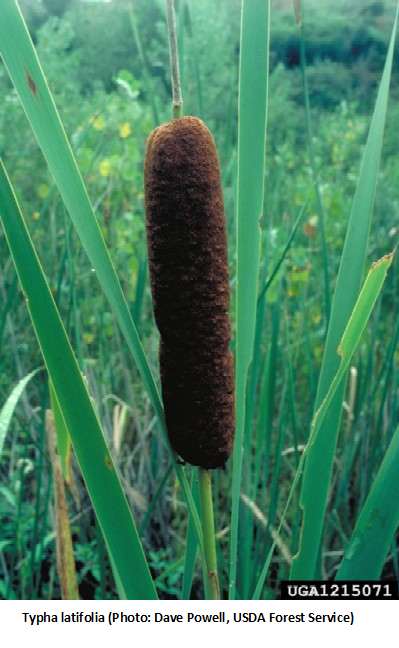 The dense growth of Cattails has other benefits, including filtration of water and erosion prevention. Traditionally, these plants were an important protein source in Spring among native peoples who also made use of the leaves for weaving baskets and mats, the fluff for insulation and padding, and fibers for string or paper. Cattails are being challenged for habitat by the invasive Common Reed (Phragmites australis) and can really use our help in getting established in suitable locations. So if you’ve an area where it is continually wet and soggy or is characterized by seasonal flooding, Cattails might be an excellent candidate. Wildlife will appreciate it and you will be able to enjoy those “sausage heads” swaying in the Summer breeze.